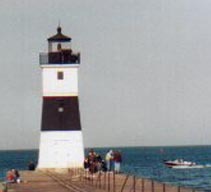 Erie Pierhead Lighthouse is also located in Presque Isle Park in Erie, Pennsylvania. The lighthouse in on the south side of the peninsula across a narrow channel from the mainland. Take I-79 North to West 12th St. Go west on West 12th St to Peninsula Drive. Go north into the park. Then follow the signs for the Coast Guard Station. As you approach the station, take a dirt road to the left and park. This seemed to be a favorite fishing spot when we were there. On a scale of 1 to 5 stars, we give it 2 stars.